PROVIDENCE — Bans on plastic bags are routinely passing in Rhode Island communities, but not at City Hall. Last March, Mayor Jorge Elorza vetoed a bag ban after last-minute pressure from the city’s Racial & Environmental Justice Committee and the Rhode Island chapter of the Sierra Club. Both groups argued that the mandatory fee on paper and other single-use bags burdens low-income residents. The City Council never held a re-vote to override the veto and a modified ordinance has yet to go before the Finance Committee. The sponsor, Jo-Ann Ryan, introduced a new ordinance on June 21. It was sent to the Finance Committee and a hearing not been scheduled.. Elorza said he supports a bag ban. Meanwhile, the ad hoc citizen group has been passing out reusable bags, hosting cleanups and organizing bag swaps at nine library branches. “Every councilperson we spoke to said they supported the (bag ban) bill, and the mayor said last year that he was committed to the same implementation schedule,” said Debbie Schimberg of Zero Waste Providence. The group wants the ban to include all check-out plastic bags, unless the bags have sewn-on handles. The group is asking the council to continue the library bag exchanges to assist residents with the transition to reusable bags. Zero Waste Providence is calling for a 10-cent fee on paper bags. “Placing a fee on bags is an effective way to change consumers' behavior. 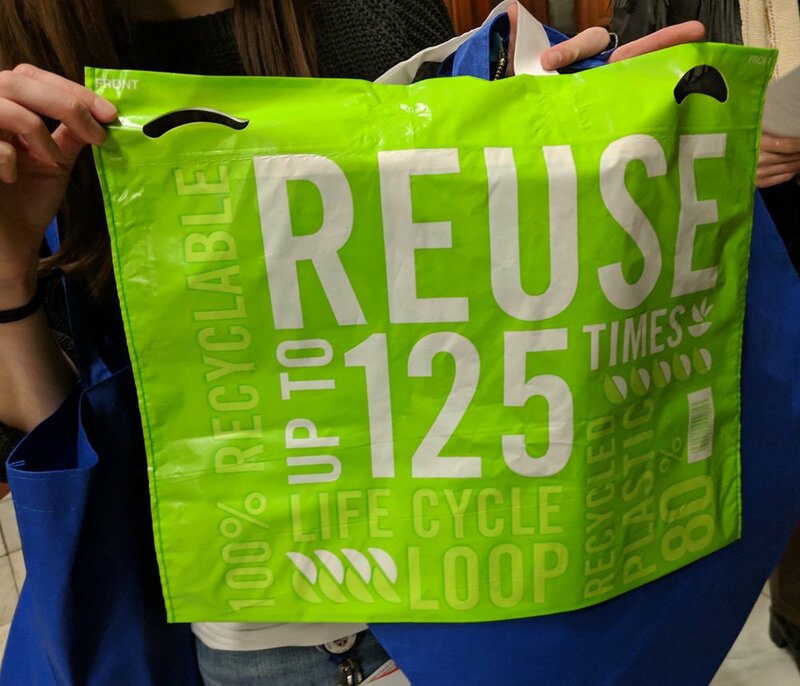 Without a fee shoppers are less motivated to bring reusable bags and instead simply switch to using paper bags,” Zero Waste Providence wrote in a letter to the City Council. The fee is the big obstacle for a citywide ban. All 1o of the municipal bans in Rhode Island don’t require a mandatory fee on single-use bags such as paper bags, although retailers are allowed to impose them. Zero Waste Providence says these bags would not qualify as reusable. Fees, however, work. After imposing a 37-cent fee but not banning plastic bags, Ireland saw a 90 percent decrease in plastic bag use. Washington, D.C., reported similar results for a 5-cent fee. What is less clear is whether a ban, fee, or both increase reusable bag use, which is a primary intent of most bag bans. Increased paper bag use is one of the consequences of plastic bag bans. A 2015 study the University of California, Berkeley found that bag bans alone led to significant increases in paper bags handed out by retailers, but the increase was less dramatic if fees on paper bags are included in the ban. The fee amount and type of replacement bags offered also make a difference in paper bag and reusable bag use, according to the study. While communities report being cleaner with bans on plastic bags, which benefits coastal habitat, paper bags aren’t without drawbacks. Paper bag production generates 70 percent more air pollution and 50 times more water pollution than manufacturing plastic bags. It takes 98 percent less energy to recycle a pound of plastic than a pound of paper. Paper bags also are nine times heavier than plastic bags, and they require more space for transportation and storage. Americans use an average of 325 single-use plastic bags annually. Retailers pay about 3 cents per plastic bag and 10 cents per paper bag. Cities and towns spend between 3.2 cents and 7.9 cents per bag that they collect through waste services and recycling. Hawaii and California have statewide bag bans. At the urging of the American Progressive Bag Alliance, a plastics and chemical industry trade group, seven states have enacted preemption laws that prohibit cities and towns from passing bag bans: Arizona, Florida, Idaho, Indiana, Iowa, Michigan, Minnesota, Mississippi, Missouri, and Wisconsin. Rhode Island towns with bag bans: Barrington, Block Island, Bristol, Jamestown, Newport, North Kingstown, Middletown, Portsmouth, South Kingstown and Warren.